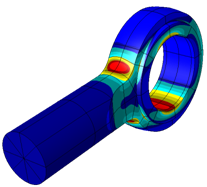 Solvers | ESRD | Engineering Software Research and Development, Inc.
StressCheck® Professional supports a wide variety of solvers, including linear, multi-body contact, nonlinear (material and large deformation), modal/buckling, steady state heat transfer, and more. What's more, the same mesh can be seamlessly applied to any solver. No element updating. This makes StressCheck® capable of true hierarchic modeling, releasing the burden of tedious element selection from users. Provides capability for a broad range of solutions in linear elasticity. Supports planar, extrusion, axisymmetric, and 3D reference frames. Multi-body contact capabilities are also included, with no limitations on the number of contacting bodies. 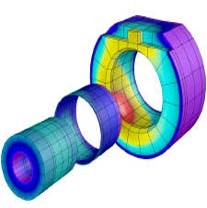 Multiple solutions can be obtained for the same mesh and convergence in the data of interest can be checked by increasing the number of degrees of freedom (DOF) by p-extension. 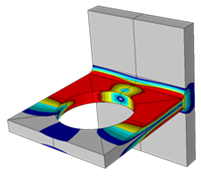 Simulation of large deformation, large strain and plasticity effects. Transition seamlessly from a linear to a non-linear solution process due to the hierarchic simulation structure. Elastic-plastic multi-body contact analysis is also supported. Allows robust computation of the eigenvalues, as well as the associated mode shapes, for modal (natural frequency) or buckling (load factor) problems. Provide a distinct advantage for eigenvalue and mode shape computation, as locking effects are minimized. Modal analysis can account for pre-stress effects. Buckling analysis can account for pre-load. 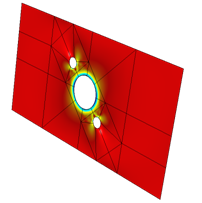 Accurately predict the in-plane residual stresses around a single hole caused by mandrel insertion (overload). Removal accounts for subsequent re-loading through linear superposition. Using a simple and intuitive user interface, the user can easily execute a cold work analysis with minimal training and receive feedback regarding the outcome. If it is necessary that multiple holes be cold worked, the Non-Linear solver should be utilized. Perform margin of safety computations within a non-linear load step solution procedure. Reliable and accurate approach that transcends limitations such as part complexity, non-linearities, and failure criteria, inherent in closed-form solutions and empirically-derived methods. 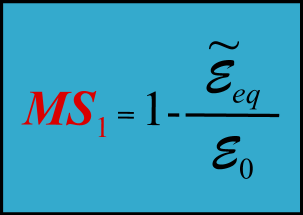 Provides global error estimations and local convergence plots of any quantity of interest. 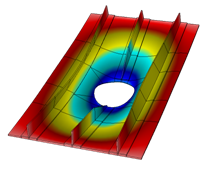 Perform linear, steady-state heat transfer analysis for metallic and composite bonded structures. Also allows for radiation boundary conditions for non-linear effects, temperature-dependent materials and ability to convert a heat transfer solution into input for a thermo-elastic solution.